Image: Clementine Keith-Roach, Kore, 2018. Ceramic, plaster, paint, Roman ring. 52 x 30 x 27 cm. Photo: Damian Griffiths. Courtesy the artist and Hunter / Whitfield Gallery. 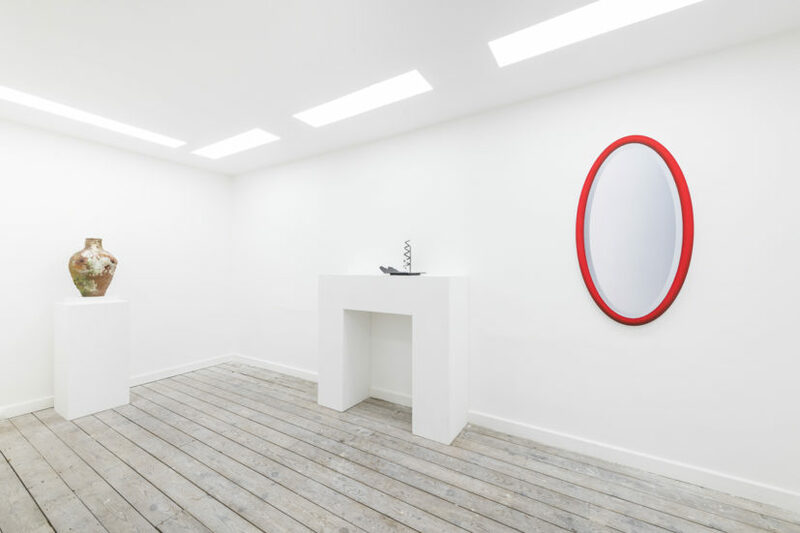 ‘Interiority, installation view’. Photo credits Damian Griffiths. 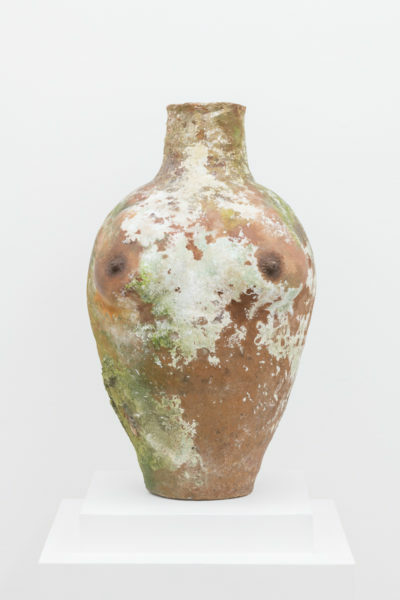 Clementine Keith-Roach Lac, 2018 Ceramic, plaster, paint 52 x 34 x 32 cm. Photo credits Damian Griffiths. Christopher Page Speculum, 2018 Oil and acrylic on panel. 120 x 60 cm. Photo credits Damian Griffiths. Ben Burgis and Ksenia Pedan Musk Chaise, 2017 Metal, Foam & painted fabric 74 x 28 x 62 cm. Photo credits Damian Griffiths. Jesse Wine Yawn, yawn, England Prawn, 2018 Glazed ceramic 35.6 x 43.2 x 38.1 cm. Photo credits Damian Griffiths. Jack McConville Veranda at Dusk, 2018 Oil on board 40 x 40 cm. Photo credits Damian Griffiths. 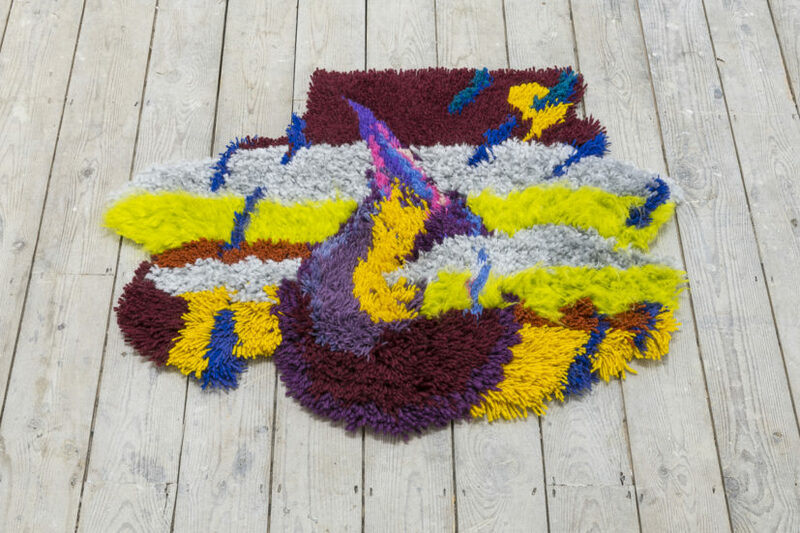 Beatrice Loft Schulz Rain, 2018 Yarn on rug canvas 92 x 71 cm. Photo credits Damian Griffiths. 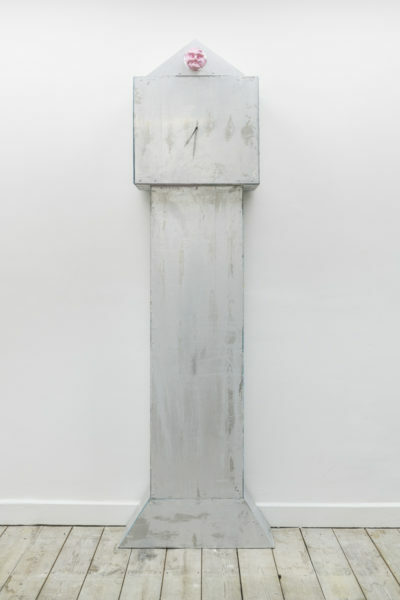 Simon Mathers Only Forward, 2018 Aluminium and epoxy resin 203 x 62 x 24 cm. Photo credits Damian Griffiths. Entering the exhibition Interiority at the new Hunter / Whitfield space in St James’s, the viewer steps into a dwelling like no other. 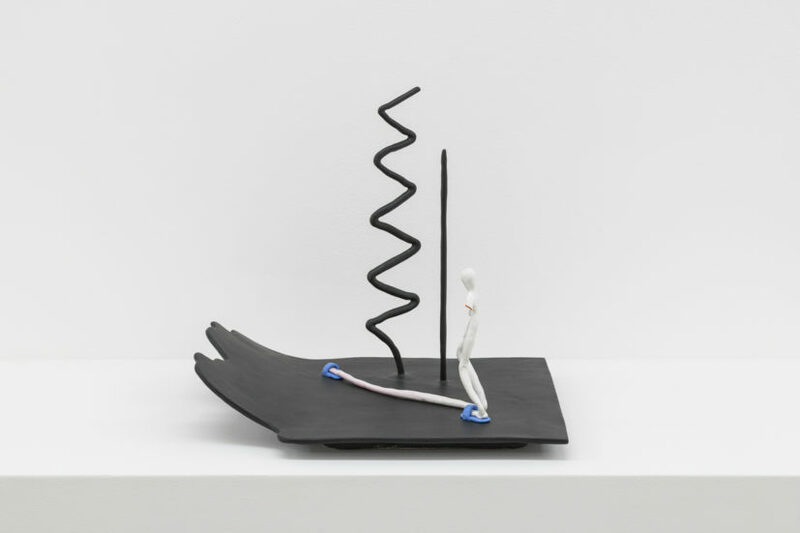 Strangely animated furniture pieces, dreamlike and convulsive forms characterise the artworks in this group show. A grandfather clock with a wild face stands in front of a vase with breasts and hands. These are Only Forward by Simon Mathers and Kore by Clementine Keith-Roach, furniture like pieces with human attributes which locate this show in the fertile grounds of imagination, an interior zone of its own. The textile piece in front of the stairs by Beatrice Loft Schulz is positioned as a rug, but is deliberately too small and disproportioned to cover the space. The painting Veranda at Dusk by Jack McConville humorously completes the room as the entrance of a bourgeois Victorian interior. Upstairs, what looks like a sumptuous mirror is actually a painting by Christopher Page. The fact that one cannot see oneself in it gives a surreal tone to the painting; with its Latin title Speculum. Above the chimney stands a delicate ceramic piece by Jesse Wine that introduces the human figure as a tiny elongated character that seems concentrated in his thoughts. 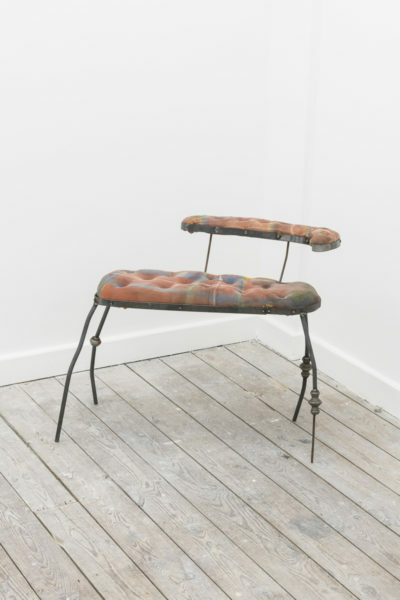 In the corner, a bench by artists Ben Burgis & Ksenia Pedan suggests an unusual psychoanalytical setting: a couch too small to lie on with what look like spider legs; too unfriendly to be of any comfort. The windows in the room have been especially sealed off for this exhibition, thus accentuating a sense of enclosure – both spatial and mental – a room apt for contemplation and dreams, an interior for our unconscious self. 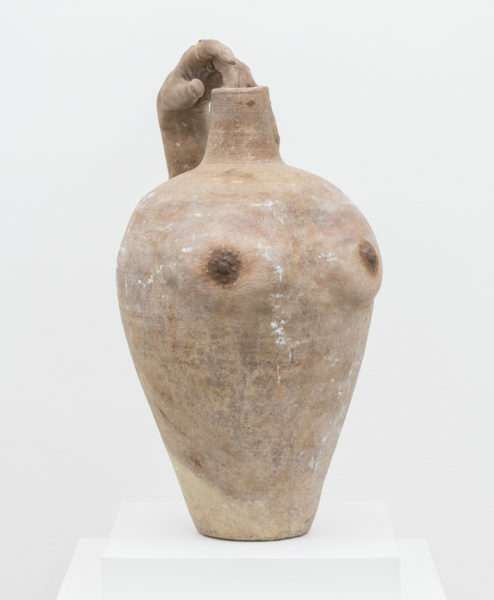 In the text accompanying the show, Keith-Roach states that “the domestic interior is the architectural counterpart to our mental interiority”, making a clear link between real space and metaphorical space, functionality and sensitivity, rational and irrational; elements emerging from the dialogue of the artworks exhibited. Lately, we have seen different displays that contextualise artworks within interiors. 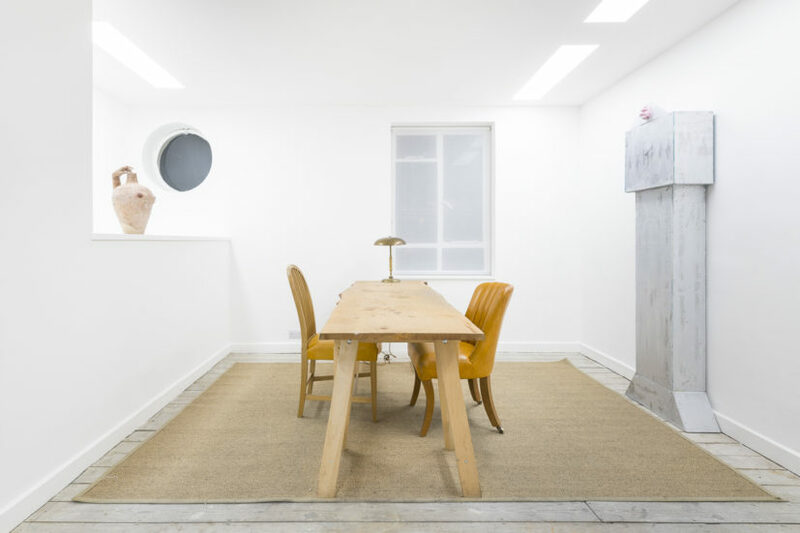 It has become a trend for galleries at Frieze, from the 1960s apartment of an imagined French collector to the reconstruction of artist Peter Blake’s studio. Such installations are often made in collaboration with interior designers to recreate a very accurate level of detail, trying to conceal the commercial purpose of the booth. Interiority is a totally different exercise: one that references surrealism and understands interiors as the incarnation of contradictory forces. Keith-Roach is not only an artist, but works as a set designer, continuing the tradition of artists working with window displays running from the German Expressionists to Andy Warhol. When leaving Hunter / Whitfield, there is the strange feeling that something might be about to happen, that the objects might start to change place and animate themselves. Almost like in the 1920s film by Buster Keaton, The Scarecrow where the objects of the stuffed apartment constantly move and are moved around. They are all multifunctional: the dining table becomes a painting, salt and pepper hang like chandeliers and the bathtub transforms itself into a couch. Keaton deals with these eccentric objects securely and steadily, subverting the traditional restriction of interior decorating where objects are given a space once and for all. 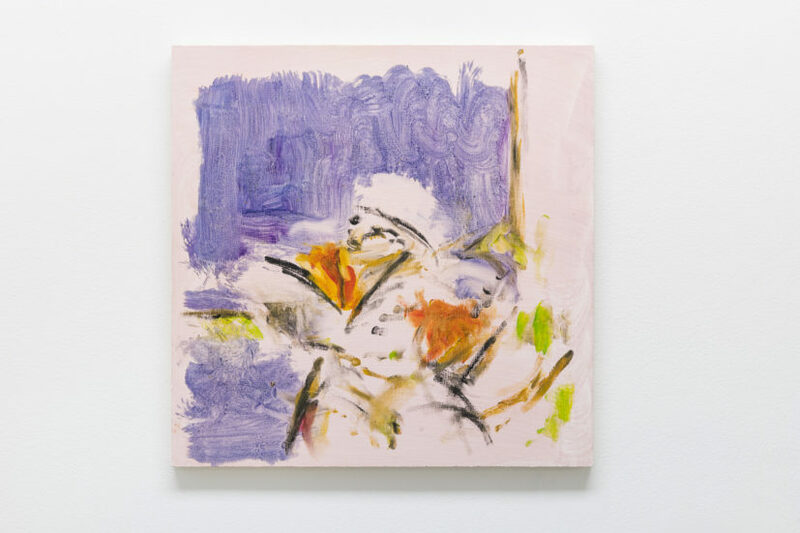 Similarly Keith-Roach has arranged the artworks in the show firmly and poetically, multiplying their possible dialogue with each other and with the visitors. 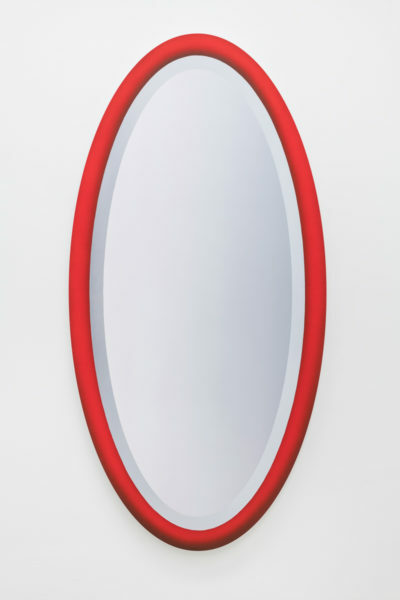 Interiority transformed Hunter / Whitfield into a sentient and pulsating interior, disrupting the logic of reality and infusing the space with all possible combinations of the rational and the irrational, creating memories and future desires.